Dogs can’t get enough elk antlers. Delicious and nutritious antler treats. The elk ask the dogs to wait until we shed them first. This is what a lot dog parents think when they first hear about antlers for dogs. However, dogs LVE chewing on antlers. Still confused? We were. Chewing: Antlers are long lasting and satisfy the dog’s need to chew. Whole antlers last longer than center-cut antlers (cut in half with marrow exposed). Highly Nutritious: High Protein, Calcium Phosphorous. Low in fat. Also include plenty of Magnesium, Sodium, Copper, Zinc and Iron. Left on the ground in the wilderness, mice and other animals consume antlers for their nutritional value. Safe: Events of accidents from chewing deer antlers compared to pig bones or cow bones is very low. 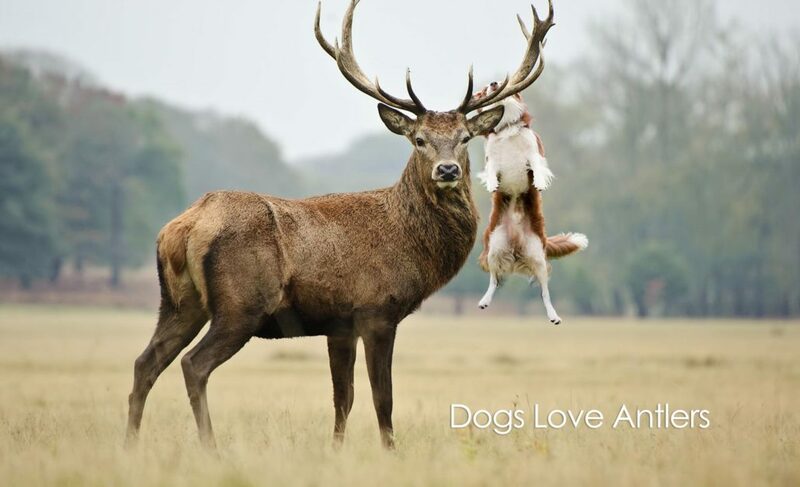 Still, no dog should be left unattended when chewing antlers. Sharp edges can occur and may need to be sanded down to prevent injury. A Variety of Shapes, Sizes, and Texture: No two antlers are alike, your dog will enjoy the variety. Be sure to chose the right size for your dog. When it antler gets small enough to become a chocking hazard. It’s time to take it away and get them a new one. Humane and sustainable: Animals (Elk and Deer) aren’t harmed for their antlers. They are shed naturally each season, picked up, cleaned and ready for chewing. Clean: Elk and Deer antlers don’t smell or stain. Both dogs and people enjoy them. What is the difference between Deer, Elk and Moose? Deer antlers are dense and hard. Elk antlers are softer and more spongy on the inside. Moose antlers are flat and don’t make for an idea dog chew. If the antler has dried out and lost it’s flavor, soak it in broth, smear some canned food or even coconut oil can spark their interest again. Don’t let your dog chew more than ½ inch per day. Too much at once can cause stomach upset. Always supervise! Antlers have had reports of causing crown fractures and large splinters can break off (although rare) and be hazardous. Other hard items to watch for; bones, hard-pressed rawhide, hard nylon bones, bully sticks. Bully horns from water buffalo can be concerning as they splinter in thick chunks. Antlers begin as cartilage and grow fast! Faster than any other bone grows. Growing as much as an inch per day during the summer! As antlers start to grow, they are still soft, blood flows through veins and the cartilage antlers are covered in velvet (a thin skin of fur). When fully grown, these antlers begin to harden and the velvet dries and is rubbed off (usually on trees). In the winter the cartilage mineralizes into hard bone and then fall off. Antlers are amazing natural structures. Scientists are studying them to unlock the secrets of fast cell regeneration and dogs are enjoying them for health and fun! Written by Jesse a HealthyPets staff member who loves all animals and is a licensed falconer, you can follow him and his animals on his instagram. BONUS: Where do these antlers come from? Antler Hunting or Shed Hunting can be illegal where you live. Some states have seasons for it. Check your state’s department of fish and game/wildlife. The antlers that are sold through healthypets.com are purchased legally through antler auctions. Many times it is boy scouts that pickup antlers to be auctioned helping with their fund raising as well as a neat, fun activity. Still, the easiest way is to let HealthyPets.com ship them to you.